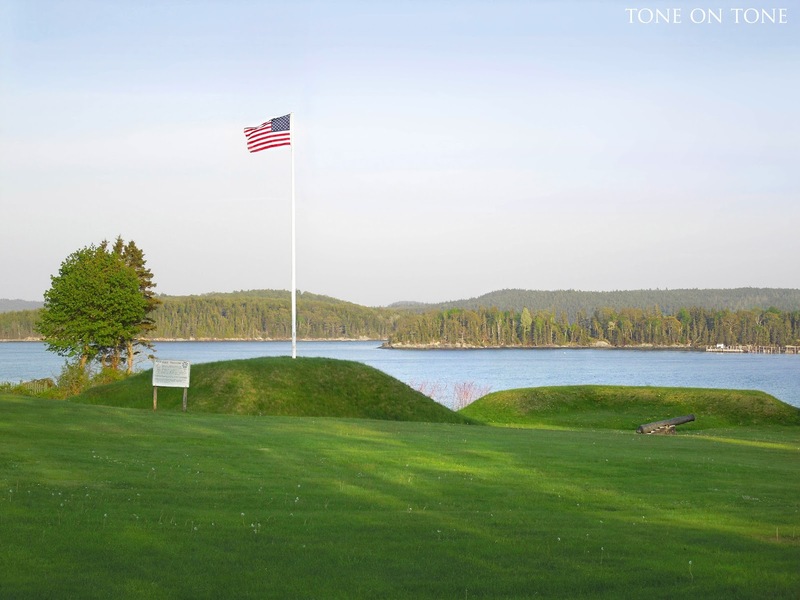 There is much to see and do in seaside Castine: golfing, sailing, kayaking, hiking, biking, playing tennis, museum going, shopping, dining, and relaxing on the beach. 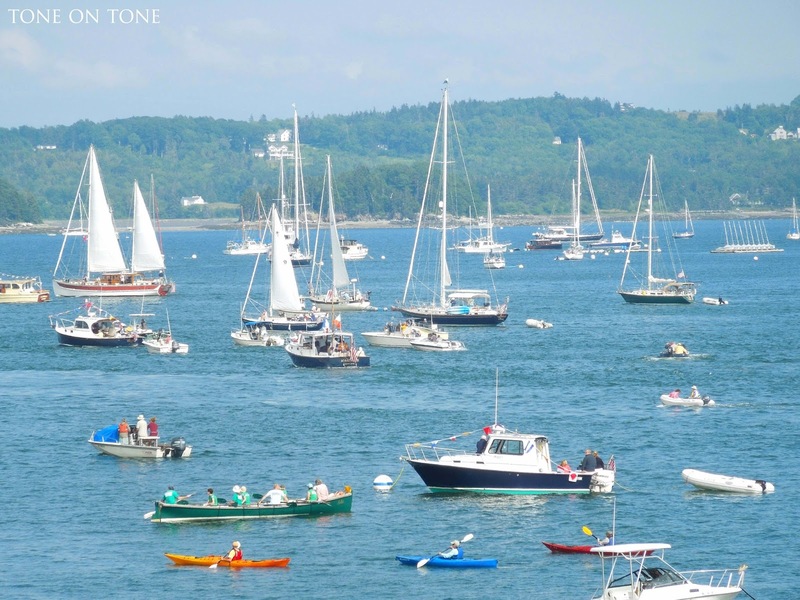 And this time of year, when Castine's weather is picture perfect, come experience our charming town - you'll be in for a treat! 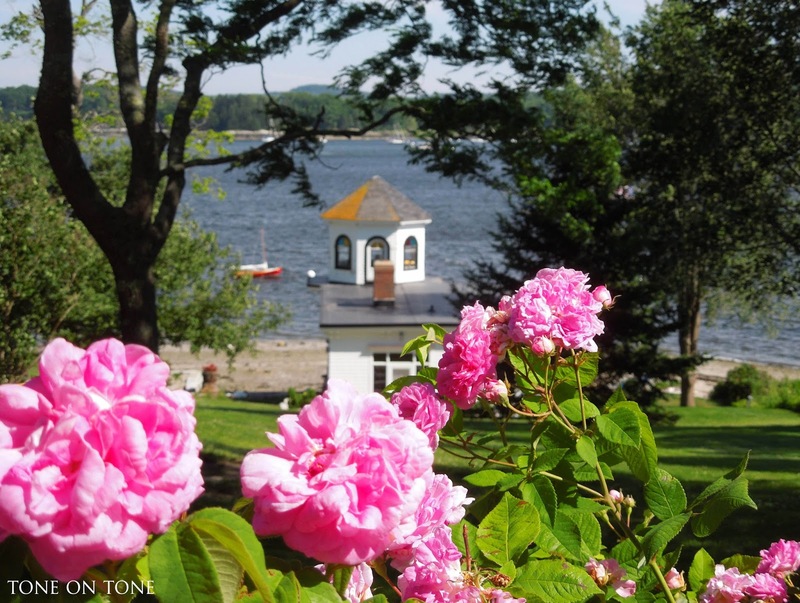 Speaking of treat, on July 13th, the Castine Historical Society (CHS) is sponsoring the 2016 Castine House and Garden Tour. 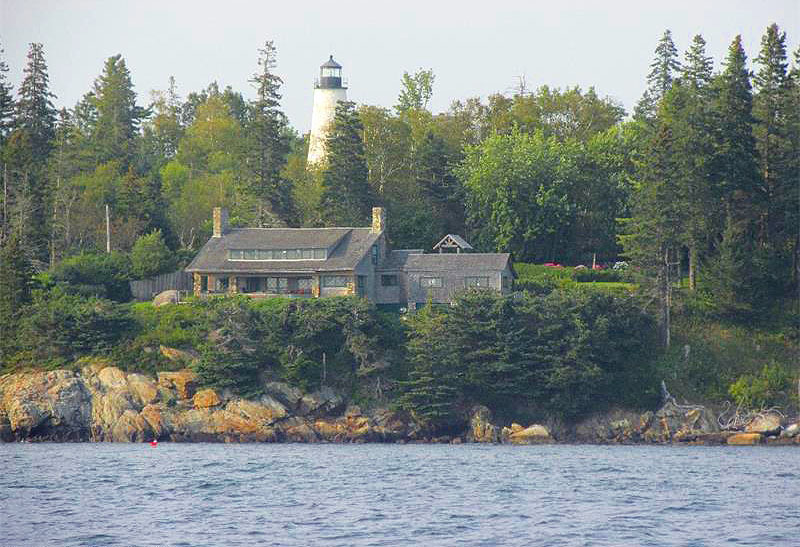 The last one was back in 2010, so don't miss this special opportunity to visit 11 private homes and 4 coastal gardens that are otherwise not open to the public. I'm thrilled that our home is included. 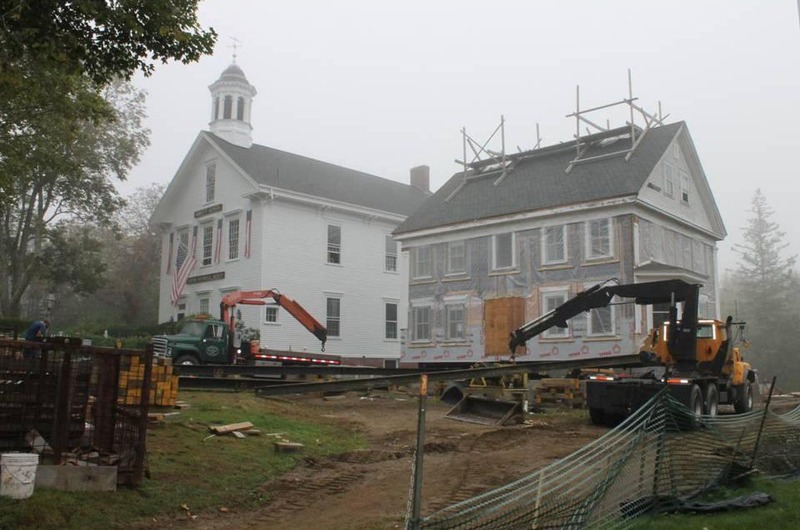 In addition, visitors will get to tour the CHS's recently restored Ca. 1850 Samuel P. Grindle House, a Greek Revival on the Town Common. Also included are the Ca. 1763 John Perkins House and Dyce Head Lighthouse built in 1828. From historic houses to summer cottages, 18 properties, all located within the town village, will welcome visitors from 10 am - 4 pm rain or shine. Advanced tickets and more information are available on the website. Many thanks to Lynne and Ruth, the Co-Chairs, for organizing this event. And thanks to the many volunteers for all of their work. Tom and I are super excited to be participating. We personally invite you to attend! Please help spread the word. Here's a sneak peek. I took most of these photos over the Memorial Day weekend when we were up to open our home. The weather was slightly chilly over Memorial weekend, but everything was lush in that fresh shade of spring green. I gardened as much as I could; felt great to dig in the dirt again! 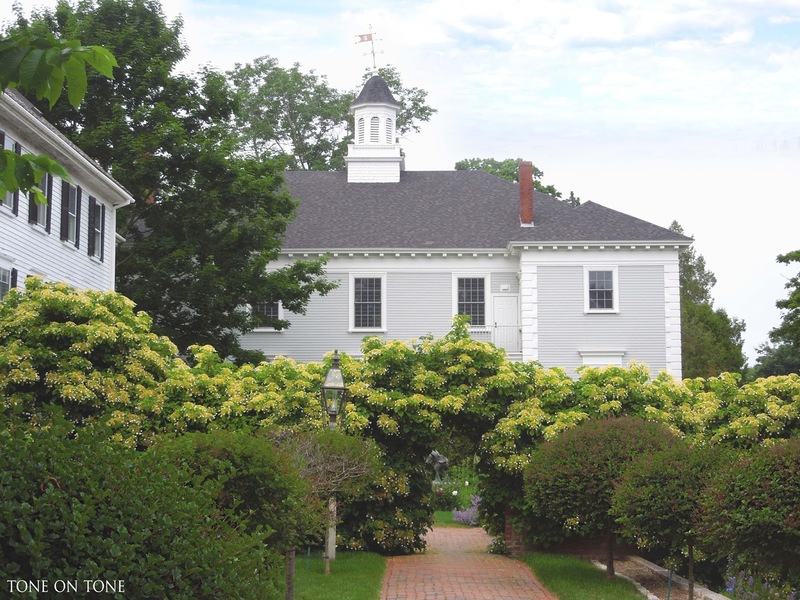 The two boxwood shrubs flanking the granite steps were just transplanted. Though full of perennials, I felt this area needed more structure. I'm planning on adding a few more shrubs to the beds, particularly near the barn / garage. Below is a photo of our house taken in 1871 - looks completely different compared to today. That's because it was originally built in the Federal style in Ca. 1804. Architectural changes in the Victorian taste were made in the late 1800s. A third floor was added along with a mansard roof. When you visit on July 13th, check out the other Victorian details such as the staircase railings, windows, etc., as well as the original Federal features. Feel free to ask us or the hosts and hostesses. 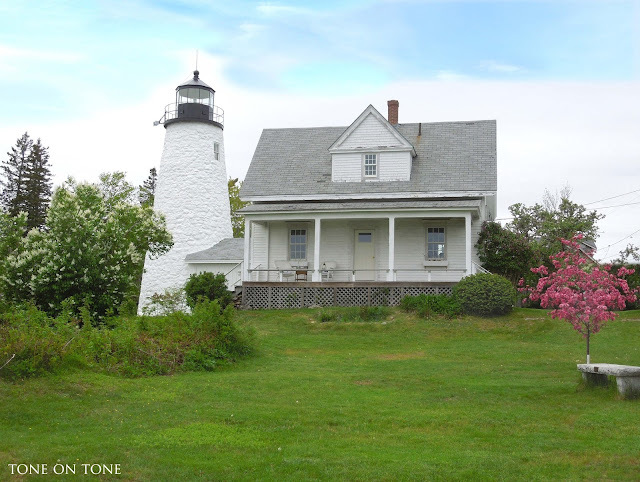 This handsome residence with its distinctive hexagonal shaped cupola will also be on the tour. It's known as the Ca. 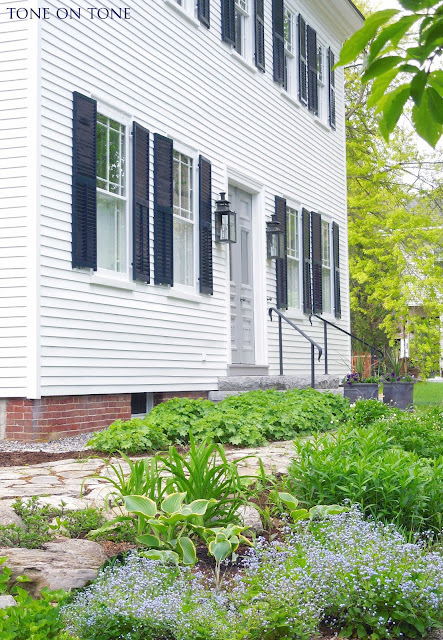 1830s Samuel Adams House. 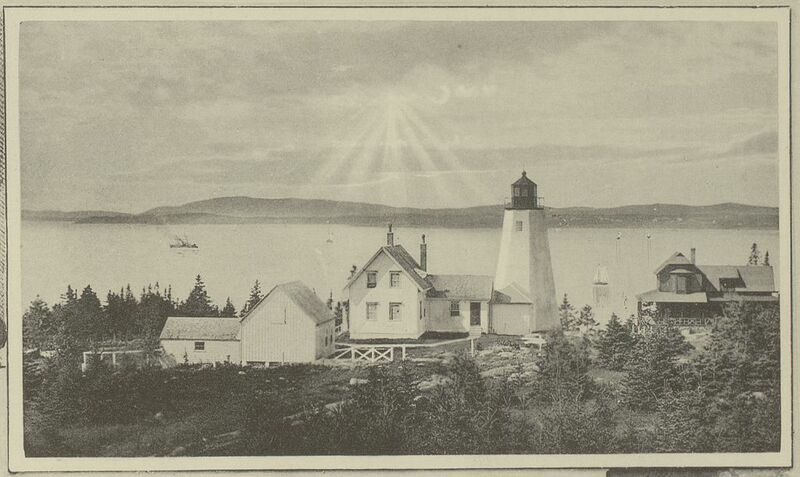 Adams was a successful merchant with a prominent general store in downtown Castine. 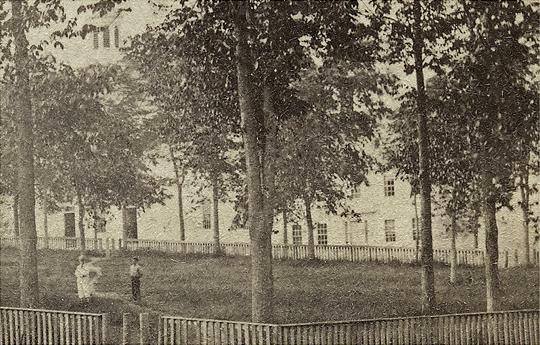 He was one of the founders of the Adams and Abbott Schools, both still overlooking the Town Common. Let's head over to the Town Common. 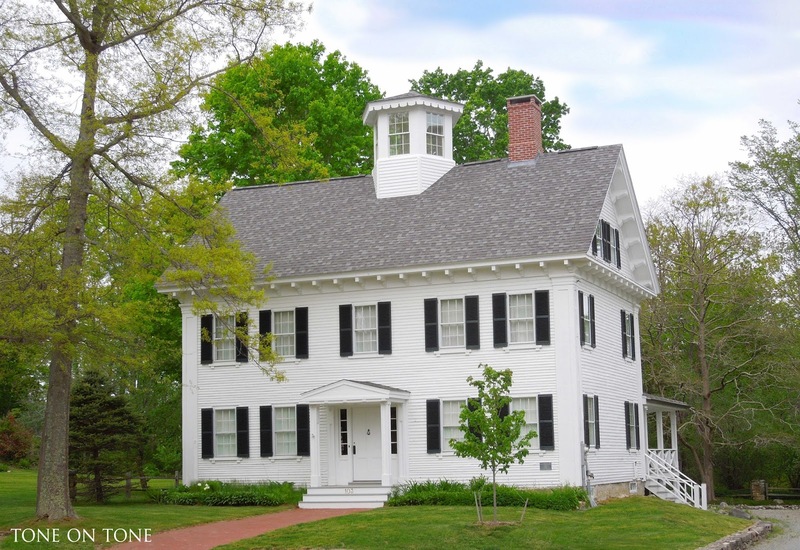 Below is the Samuel P. Grindle House, a Greek Revival built in Ca. 1850 for Grindle, a ship carpenter. It was acquired in 2008 by the CHS, and expertly restored and renovated to provide research and small exhibition spaces, staff offices, and state of the art archival storage. Here is the newly decorated front parlor with furnishings, fixtures and wallpaper that are all appropriate to a house of this period - it's what the Grindles might have used during the mid 19th century. See more on July 13th. Two photos (courtesy of the CHS) of the Grindle House. 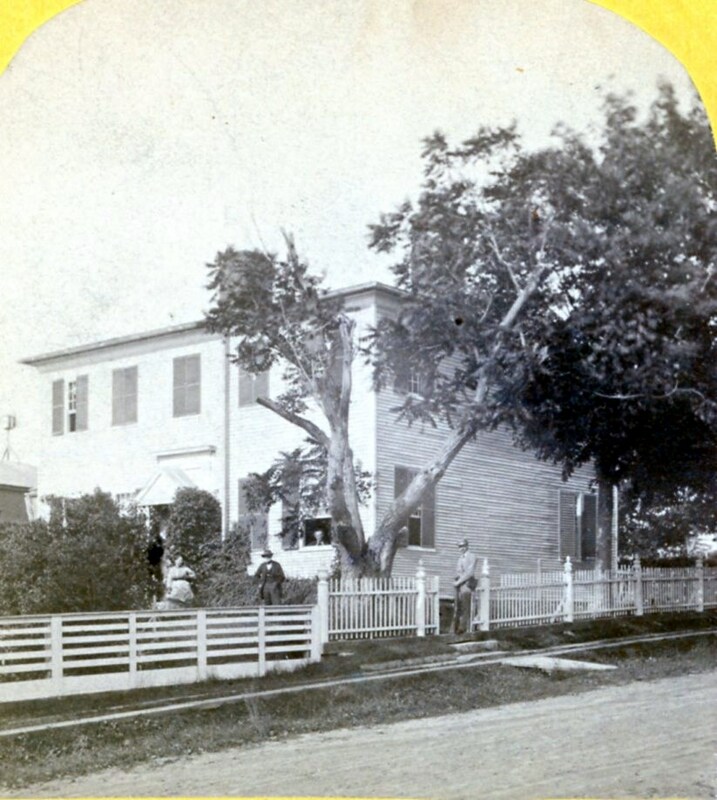 The above image is from the 1870s; below photo taken during the restoration. 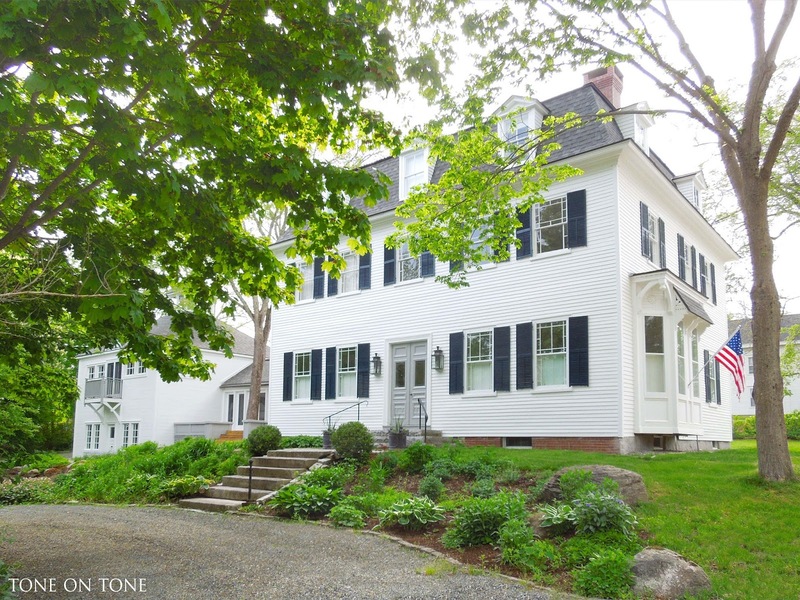 In addition to the crisp white clapboards, Castine is graced with many other beautiful and unique homes. Don't miss this stunning Ca. 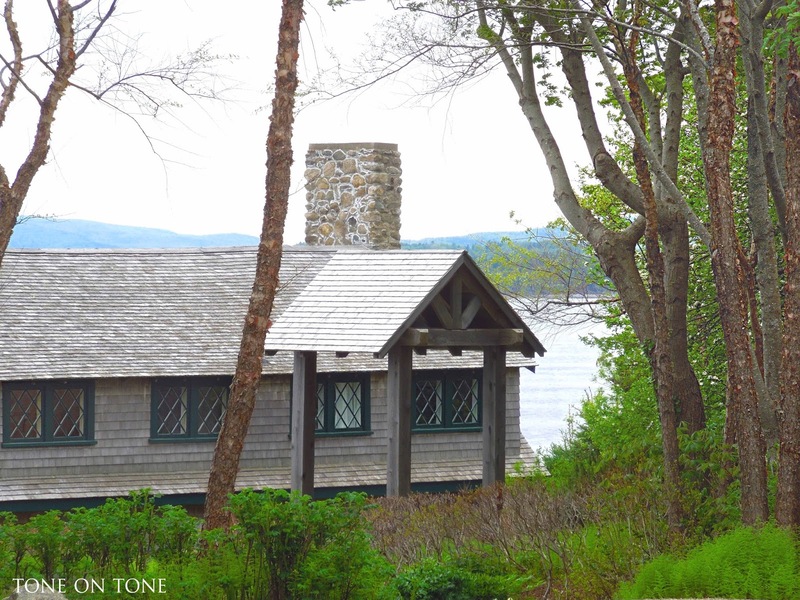 1890s Arts and Crafts cottage perched on the ledges of Dyces Head with breathtaking views of the sea. Behind is the lighthouse. 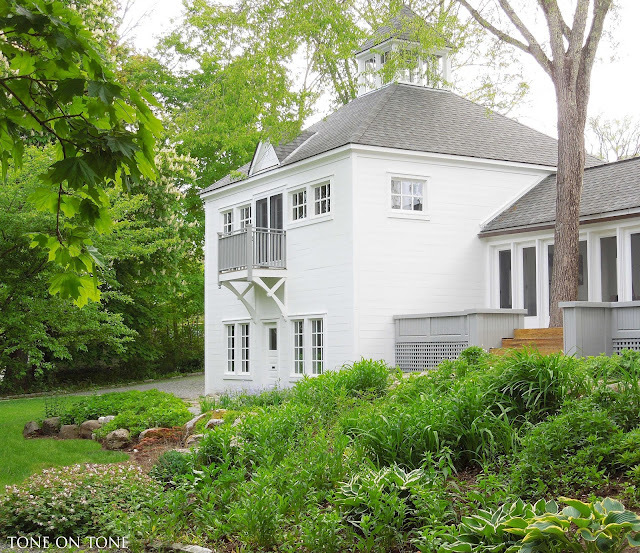 Photo (below) courtesy of Saltmeadow Properties. 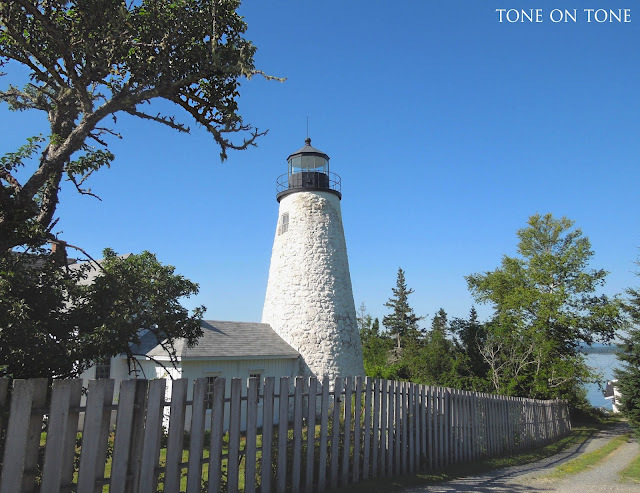 Dyce Head Lighthouse will also open to tourgoers. This is high on my list as I've never been inside. 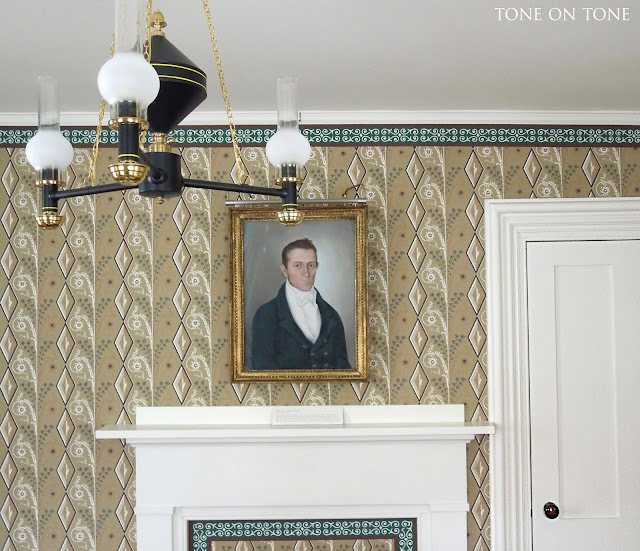 At the John Perkins House, now a museum, visitors will step back in time to experience 18th century living in Castine's oldest standing home. 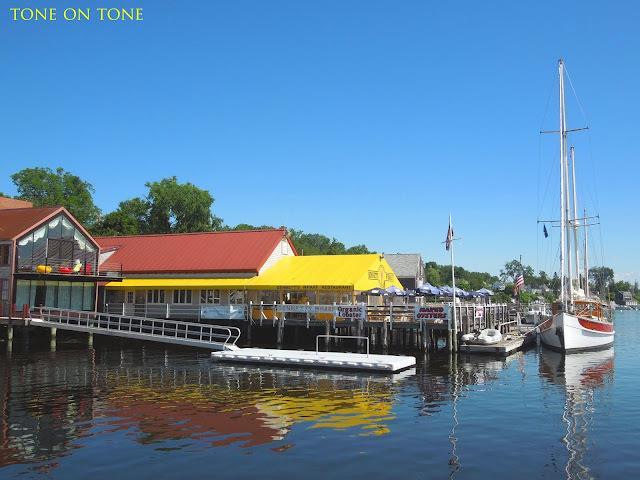 Originally built on Court Street, it was moved piece by piece in 1969 to the current location overlooking the harbor. Here is one of the featured gardens. It's on the grounds of the Ca. 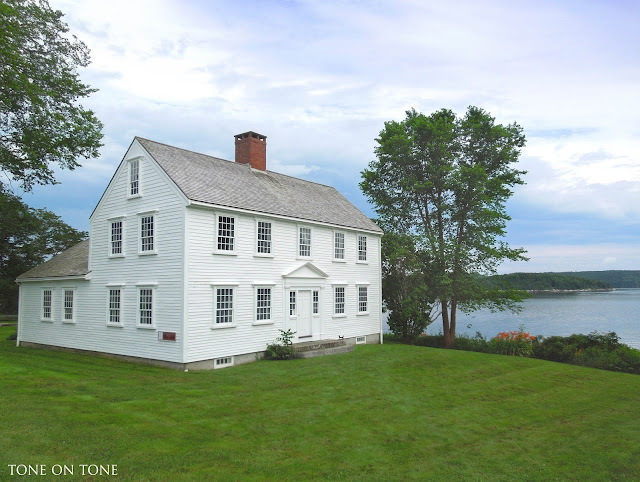 1796 Parson Mason House. An allee of standard lilacs graciously leads visitors to the terraced gardens beyond. There are many more homes and gardens to enjoy. Plus a lovely luncheon at the Manor Inn. Now for a quick stroll around town. 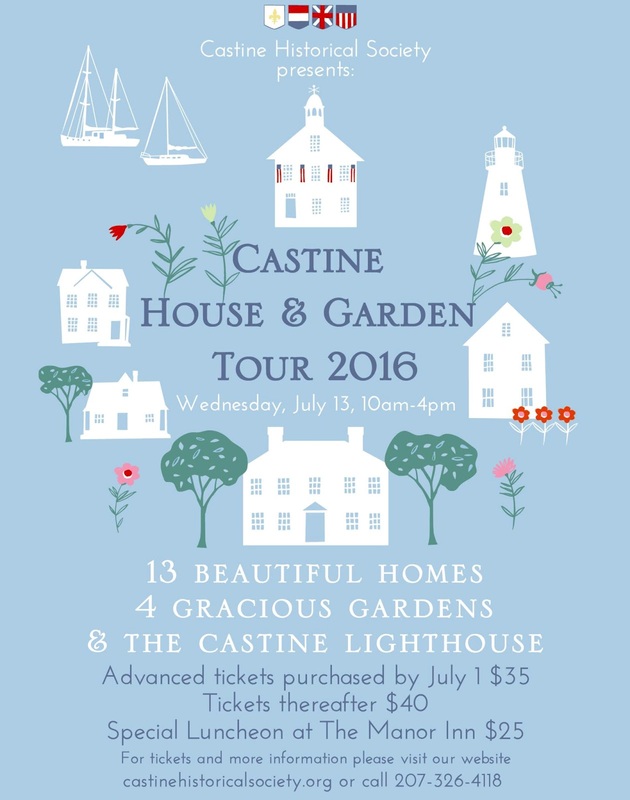 Please visit the 2016 Castine House and Garden Tour website for all the information. You can purchase your advanced ticket at a reduced rate HERE. PS - For more, follow along on my INSTAGRAM.